The digital collections of the Greek State Archives offer a wealth of information to those of us interested in Greek genealogy. 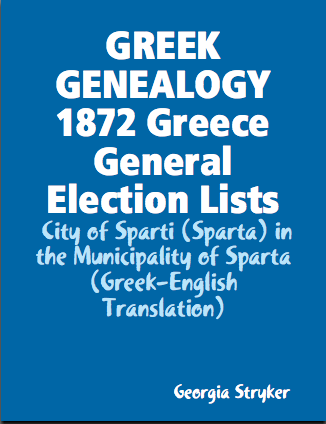 Included are the "1872 General Election Lists" for each Municipality. Each row includes: Line # - Given Name, Surname - Age - Father's Name - Occupation. 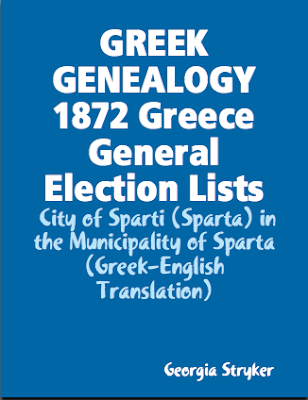 I have translated these pages and made them available in both Greek and English for the city of Sparti (Sparta) in the Municipality of Sparta, Lakonia. Georgia, Thank you so much for doing all this work! I just purchased this and am so grateful to you! Hi Carol - I hope people find these helpful. I just finished Mistra, and will start working on some of the surrounding villages today. Would this list include nearby Chrysaffa?